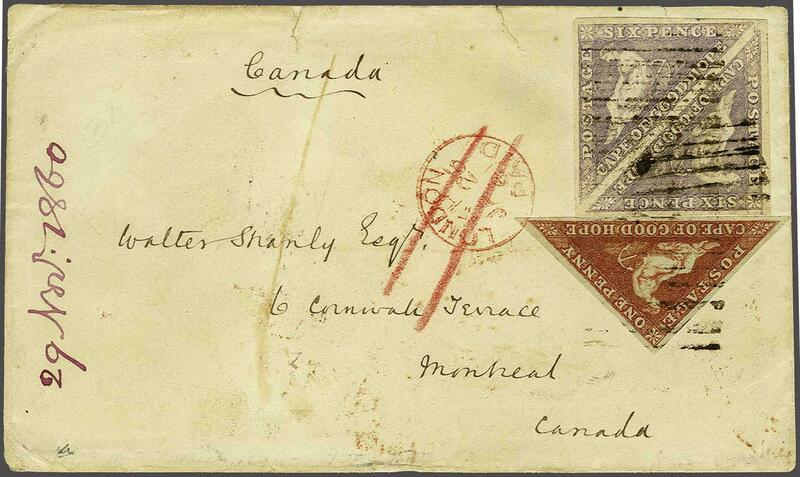 1855/63: 6 d. deep rose-lilac on white paper, a fine square pair with large margins all round used with equally fine 1 d. red-brown on slightly blued paper (a late usage), on delightful 1860 cover to Montreal, Canada unusually cancelled by the roller barred handstamp in black with corresponding oval GRAHAMS TOWN datestamp in red on reverse (Dec 14). 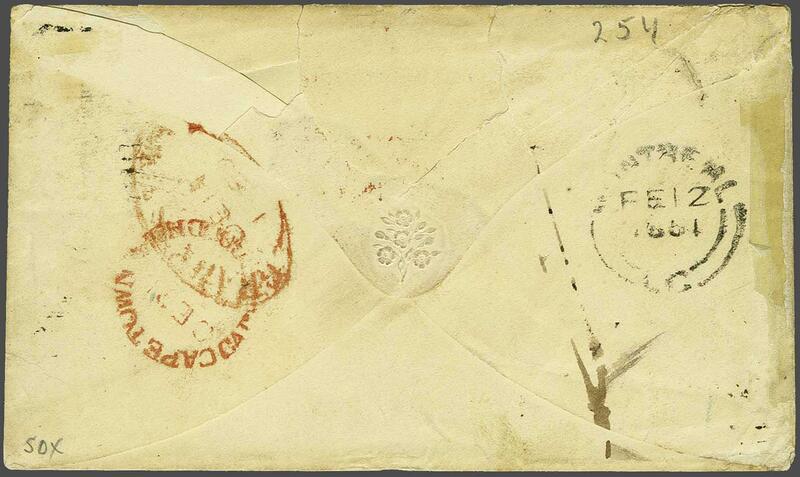 Transit of CAPE TOWN / CAPE OF GOOD HOPE circular datestamp alongside in red and Montreal arrival cds in black (Feb 21, 1861). Obverse with 'London / Paid' cds of transit (Jan 26) in red and '11' (pence) rate credit in manuscript. Two tiny tears at top of envelope well away from the adhesives, a beautiful and very rare cover. Ex Vincent G. Greene.rnrnProvenance: Collection Theodore E. Steinway, Harmers, New York, 11-12 March 1958, lot 254.rn Collection Mrs. Ad Indhusophon, Spink, May 1999, lot 93.rn Collection William H. Gross, Shreves, Oct 2008.